An original letter of correspondence between brothers and business partners Joshua Coffin Chase and Sydney Octavius Chase. Topics discussed in the letter include a letter from A. Q. Lancaster and his suggestion of dishonest activities performed by C. E. Browne. Original letter from Joshua Coffin Chase to Sydney Octavius Chase, March 31, 1923: box 49, folder 20.84, Chase Collection (MS 14), Special and Area Studies Collections, George A. Smathers Libraries, University of Florida, Gainesville, Florida. 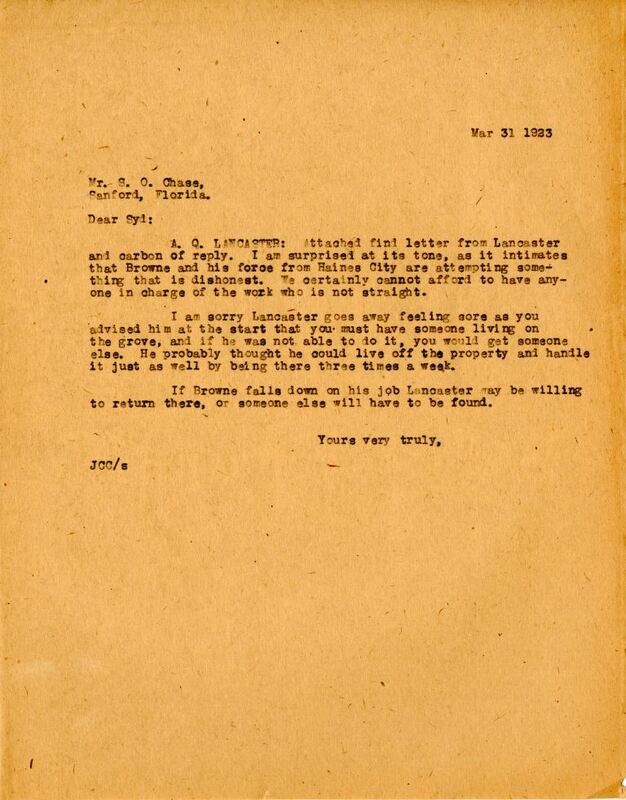 Digital reproduction of original letter from Joshua Coffin Chase to Sydney Octavius Chase, March 31, 1923. A. Q. LANCASTER: Attached find letter from Lancaster and carbon of reply. I am surprised at its tone, as it intimates that Browne and his force from Haines City are attempting something that is dishonest. We certainly cannot afford to have anyone in charge of the work who is not straight. I am sorry Lancaster goes away feeling sore as you advised him at the start that you must have someone living on the grove, and if he was not able to do it, you would get someone else. He probably thought he could live off the property and handle it just as well by being there three times a week. If Browne falls down on his job Lancaster may be willing to return there, or someone else will have to be found. Chase, Joshua Coffin. 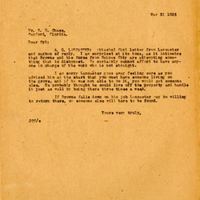 “Letter from Joshua Coffin Chase to Sydney Octavius Chase (March 31, 1923).” RICHES of Central Florida accessed April 24, 2019, https://richesmi.cah.ucf.edu/omeka/items/show/2729.